CFOA has congratulated the 14 members of the fire sector who were recognised in the New Year Honours List. Leading the honourees were Chief Fire Officer Paul Fuller of Bedfordshire FRS (pictured) and DCLG Director of Fire, Resilience and Emergencies Neil O’Connor who awarded the Commander of the Order of the British Empire (CBE). CFO Fuller is the first Bedfordshire Chief Fire Officer to be recognised as a CBE having previously been awarded the Queens Fire Service Medal for exemplary service in the Birthday Honours 2008 and being made a Freeman of the City of London in 2012. Reacting to the honour, he said: “I am hugely delighted and honoured to be recognised in this way, and I am grateful to all those people who supported the nomination. "Although a great personal honour, this is also a well-deserved tribute to everyone in Bedfordshire Fire and Rescue Service, the Chief Fire Officers Association and partners throughout the fire sector for the marvellous work they do to save and protect people’s lives. I am also pleased that this award recognises my work through the Children’s Burns Trust to raise awareness and support burns and scalds survivors." Elsewhere, West Midlands' Group Commander Sean Moore was awarded the Officer of the Order of the British Empire (OBE) for his more than two decades of dedication to international search and rescue that has seen him deployed across 4 continents. GC Moore was among the personnel who responded to Hurricane Rita in the US, and earthquakes in Turkey, Indonesia, Haiti, New Zealand, Japan and Nepal. Last year he coordinated the UK response to flooding in Bosnia. His humanitarian work has also included trips to Romania, Bosnia, South Asia, China, the Middle East and Tanzania. In 2014 he coordinated fire and rescue service resources supporting logistics for the UK response to the Ebola crisis. He said: “I feel very humbled and honoured to be recognised with the OBE. It was a total surprise – I had to read the letter several times before I understood what it was! I only wish my mum, who passed away five weeks ago, could have been here to see it. I see my search and rescue work as an extension of what firefighters do every day. I simply enjoy helping people, especially at their greatest hour of need." Communities Secretary Greg Clark offered his congratulations to all those honoured from across the fire sector including representatives of the Children's Burns Foundation, Devon and Somerset Ceremonial Unit and several senior officers. Maurice Dodd, Volunteer, North East of Scotland Fire Heritage Trust. For voluntary service to the Scottish Fire and Rescue Service in the North East of Scotland. David Lenagan, for services to Greater Manchester Fire and Rescue Service and the Children’s Burns Foundation. Richard King, Retained Watch Manager, Lincolnshire Fire and Rescue Service. For services to Fire and Rescue and to Emergency Medical Care. Ian Washburn, Drum Major, Devon and Somerset Ceremonial Unit, Devon and Somerset Fire and Rescue Services. For voluntary services to Music and Firefighters’ Welfare. 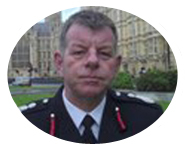 David Walton, Assistant Chief Fire Officer, West Yorkshire Fire and Rescue Service.